Marina Reiter and Agora Gallery : : Featured on Conceptual Art Network, ltd's 200 Blogs and Sites. Will You Be Next? Published on Jul 15, 2013 Marina Abramović (born November 30, 1946 in Belgrade) is a New York-based Serbian performance artist who began her career in the early 1970s. Active for over three decades, she has recently begun to describe herself as the "grandmother of performance art". Abramović's work explores the relationship between performer and audience, the limits of the body, and the possibilities of the mind. 1.Art must be beautiful, Artist must be beautiful. Joseph Beuys was a German-born artist active in Europe and the United States from the 1950's through the early 1980's, who came to be loosely associated with that era's international, proto-Conceptual art movement, Fluxus. 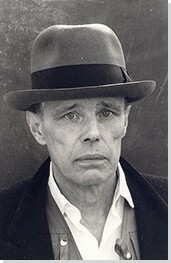 Beuys' diverse body of work ranges from traditional media of drawing, painting, and sculpture, to process-oriented, or time-based "action" art, the performance of which suggested how art may exercise a healing effect (on both the artist and the audience) when it takes up psychological, social, and/or political subjects. Beuys is especially famous for works incorporating animal fat and felt, two common materials - one organic, the other fabricated, or industrial - that had profound personal meaning to the artist. They were also recurring motifs in works suggesting that art, common materials, and one's "everyday life" were ultimately inseparable. © Tate Liverpool, Laura Deveney “When I was in my teens I had a subscription to a magazine that championed Japanese pop culture; it introduced me to the edgy and frequently beautifully rendered worlds of Anime and Manga – Japanese animation and comic books. I was hooked in particular by the style of illustration used to bring the characters that populated these stories to life – all cool, angular hair and androgynous features. Years later I’m still a sucker for films by the likes of Studio Ghibli, the producer of contemporary classics such as Spirited Away, Ponyo, and The Wind Rises. It’s fascinating to see how something that was once so niche has become ‘just’ another way for western audiences to consume animated film. Despite its adoption by the mainstream, however, I don’t think I ever envisaged seeing anything inspired by this medium exhibited at Tate Liverpool.